RockUnitedReviews: XORIGIN: "State Of The Art"
Like the old saying goes 'where to draw the line between pleasure and pain, past and present, catchy and cliche? I believe it's a battle of the mind and I still haven't figured out the winning side as I'm typing down the words about "State Of The Art". It's the debut album by Xorigin - a mixed duo out of Scandinavia (a Norwegian and a Swedish guy) and very capable of writing tunes that on one hand are sort of catchy and nice, but on the other, so strangely familiar, borderline deja vu. I know of vocalist Johannes Stole from the Norwegian progressive rock band Slaves To Fashion (see reviews in archive) and guitarist/keyboardist Daniel Palmqvist' done session work and played in bands for years. Also onboard the spaceship (simply check artcover picture for proof) drummer/producer Daniel Flores -known from all sorts of bands and projects in the past (perhaps mostly prog). The Xorigin project was originally formed in the states (Los Angeles), while the members where studying music there in approx 1999. The result is both good and bad. 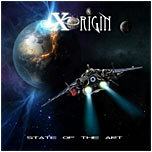 When Xorigin get it right, which they do on several tracks, they sound utterly amazing and truly professional. It's once again a mixture of the rather typical (radio) pop rock sound out of Scandinavia (Sweden), AOR and Westcoast - plenty of dut-dut keyboards and hardly any loud guitars to be found. The first two opening tracks are however not to my liking (Can't Keep Running, Crying For You). The sound is simply too sterile and too forced to bare any interesting points. They pick up the torch of Chicago 'ala 1989 and album "19" on "In The Blink Of The Eye" and the result is very pleasing to these ears. Great harmonies and a Chicago hook to die for. "Too Late", pretty good, one of those songs that's neither pop nor rock. "Gina" comes out swinging like an intoxicated Kip Winger at the Peter Cetera/Chicago congress, while, "This Is It" and "Said and Done" simply kills (extremely catchy pop rock with a twist - neato!). "Matters To The Heart" and "What Love Is All About" are certainly inspired by Yes in the era of "90125" and "Big Generator". However, you'll have to add just as much of the catchy pop/rock out of Scandinavia to reach the core of things. Final verdict: High-tech AOR or simply just poppy rock? I dunno, it's a fine line, hair-splitting, etc. I know that I enjoyed most tracks though and that's not a too shabby result really.